I have to admit, I've given the 47 short shrift. I've taken it twice, and I've never reviewed it yet. Today, I was going to review the 70 or 71, but then I saw that my blog has 47 posts (including drafts). I figure that was a sign that I should finally give the 47 some recognition. That's not to say it's not popular, as it was relatively crowded when we rode on a Sunday. Of course, everyone got off at Fenway, but it was crowded nonetheless. The bus starts out at the big bus shelter in Central Square, the one on Mass Ave. Immediately after leaving, it makes a sharp turn onto Pearl Street. What follows is a lot of twists and turns through the residential neighborhood of Cambridgeport. Due to one way streets, the route the bus takes is different depending on which way you're going. The bus then crosses Memorial Drive and goes over the B.U. Bridge. It has a decent view, although there are much better views elsewhere on the system. Don't you hate it when bus drivers turn the destination board to "NOT IN SERVICE" and ruin your picture? The bus then crosses the B branch of the Green Line, although the B has no stop there. It then turns onto Mountfort Street, right next to I-90. Then it turns onto Park Drive and passes the C branch just before it goes above ground to Saint Mary Street Station. It then crosses over the D branch and serves Fenway Station. This is where many of the people on our bus got off. The bus then goes down Brookline Ave to serve the Longwood Medical Area. This is another big area in terms of ridership. After serving the LMA, the bus makes its way to Museum of Fine Arts Station on the E branch of the Green Line. It then travels down Ruggles Street and serves Ruggles Station. Instead of following the other buses on Malcolm X Boulevard, the 47 goes on Ruggles Street (or Melnea Cass Boulevard in the other direction) to Dudley Station. The bus then serves the B.U. Medical Area, which has a small number of bus routes for MBTA standards. It then goes onto Albany Street, leaving the many buildings of the Medical Area for a more industrial neighborhood. 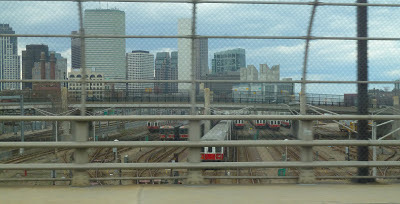 It goes under I-93, and then turns onto West 4th Street, a bridge with a great view of the Red Line's Cabot Yard, as well as the bus area of the yard. There are numerous buildings again as the bus pulls into the Broadway Station bus stop. A terrible picture of Cabot Yard. That darn fence got in the way. Ridership: In our case, there were a lot of sports fans looking to see a baseball game at Fenway Park. In most other cases, people probably just use it to save time (see "pros" below). This is not a bus that people would take from beginning to end, though, as the train is a much faster link between Central Square and Broadway. There were about 40-50 people on our bus. Pros: It's a great crosstown bus. It can save a lot of time if you're trying to go from Central Square to Fenway, for example. It's also the only MBTA bus to serve Cambridgeport (besides the 64, but that's only in one direction), and it cuts right through. People seem to use these portions, too, so it gets good ridership in Cambridgeport. It has a pretty good schedule, with headways of a good 22 minutes on weekdays and 24 minutes for most of Saturdays. Cons: Every 40 minutes on Sundays isn't very good, especially because of the ridership I saw, and because of the urban nature of the bus in general. Based on what I saw, the bus really doesn't have to go to Broadway. Considering that there's not much between the B.U. Medical Area and Broadway, and the fact that there was only one person who rode past the medical area, I think that buses can just terminate at the B.U. Medical Area. Perhaps the ridership is different on weekdays, but going all the way to Broadway seem unnecessary based on what I saw. Nearby and Noteworthy: Aside from places in Central Square, which is for another post, the bus (as well as a few others) goes quite close to the Museum of Fine Arts. Most people probably know about it already, because it's a great museum that recently had a large expansion. If you haven't been, I strongly recommend you go. I think the best thing about this bus is the fact that it's a great time saver. It also connects with all of the MBTA lines except for the Blue Line. However, unlike the 1 or the 66, this bus does not run very frequently, at least not on Sundays. The rush hour headways are also bad compared to the 1 or 66, but every 22 minutes is pretty good for a non-Key Bus Route. I also don't think it needs to go all the way to Broadway, but that's just my opinion. Overall, it's one of the great shortcuts on the system. 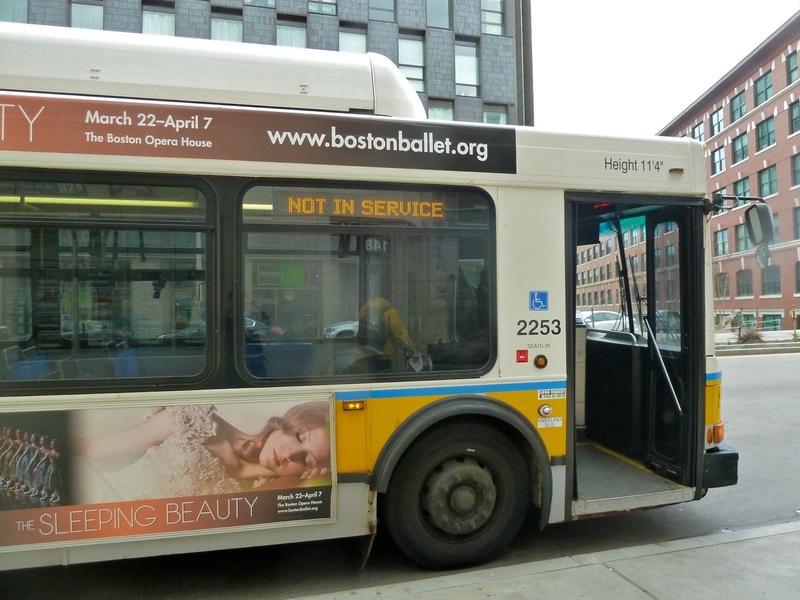 Latest MBTA News: The MBTA is launching a Key Bus Route Improvement Program to improve Key Bus Routes physically and in terms of service. The parking lot at Salem Station on the Commuter Rail is due to close for a massive renovation. There will be shuttle buses on the Blue Line from Suffolk Downs to Wonderland on June 23, 24, 25, 27, and 30 from 9 PM to the end of service. There will also be shuttle buses on the Red Line between JFK/UMASS and North Quincy this weekend. In addition, there will be another bus review on Tuesday because my mother and I are taking a trip to London and Germany! I'll be back on the following Tuesday to talk about my public transit experiences, with numerous pictures. This route is so useful but off peak frequency is less than desired. It is only given two buses during off peak so if you miss the bus you have to wait a long time. I also don't get why the CT2 and the 47 take different routes through Longwood. Bus service in Longwood should be rationalized and given a dedicated lane. On the northern portion of this route, the bus is absolutely packed at rush hour. It is frequently so crowded that it can't pick up new passengers at certain stops. If you time the pick-up right, it is the quickest route from Central Square in Cambridge to the Longwood Medical Campus and back. It takes about 35 minutes from Central Square to Longwood in normal rush hour traffic. The alternative is 15 to 20 minutes from Central to Park on the Red Line, followed by 30 to 40 minutes on either the D or E trains of the Green Line. I assume the bus gets more rush hour traffic on the southern route, as well, as people who take the Red Line north from Quincy get off and take it to Boston Medical.